Ming's father is the local archaeologist in a small town in Maoist China in the 1970s. But Chairman Mao is not a friend of intellectuals--Ming's father is in danger of losing his job unless he can make a spectacular find, and Ming himself is the friendless target of the anti-intellectuals in the community. One day, when his father is off in the city, men come to Ming's home with the find that will put his town on the map. They have found the fragments of a life-sized terra-cotta soldier. Maybe the rumors are true, and the tomb of the great Emperor Qin who united China in 221 BCE, who is guarded in death by a whole army of such soldiers, is nearby....but can what can Ming, one lonely and hungry boy, do to find and claim it for his father's sake? 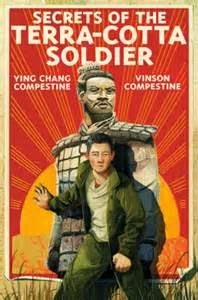 And then Ming finds he has an unlikely ally--the terra-cotta soldier, once a soldier named Shi, is alive. Shi shares with Ming the story of his life in the emperor's army thousands of years ago...and as the local communist leaders/bullies move in on the tomb, Shi takes Ming there to save it from their plan to dynamite their way in. Both stories--that of Ming and Shi in the present, and Shi in the past, are fascinating, and any kid with an interest in archaeology will be intrigued. The exploration of the emperor's tomb, filled with traps, is especially exciting. It's also a nice introduction to life in China under Mao, and black and white photographs, some of archaeological finds, some showing life in Communist China, that make it clear that the story is based in reality. The mix of the two stories, the photographs, and the crisp narration make this a good one for the type of kid who isn't into voluminous fantasy but prefers non-fiction, who might be ready for an interesting change of pace. I myself found it made a nice change, as kids books in which fantasy intrudes into Communist Chinese village life are not exactly thick on the ground! Wow, I wish I had this book as a kid! I was fascinated by the Terracotta Soldiers. I will have to check it out. I bought a copy for my library, and it's been slow to circulate, but I do like this author. The terra cotta soldiers are so interesting!